I didn't read nearly as many books in 2011 as I would have liked - only 18, but it's not too shabby compared to last year's 19, and considering I had a baby. Here are the ones I read! I like to list them at the end of the year for my own records, but I didn't do a review of each book this year like I did in years past. It just seemed like too much effort. So I'll just put in a word or two to say what I thought - let me know if you want more details about what I thought of any of these books! Bringing Up Boys by Dr. James Dobson - Good. Jane Eyre by Charlotte Bronte - Enjoyed it. Almost Empty: An Inside Look at The Passion Week by Stephen Davey - Very good. The Yada Yada Prayer Group by Neta Jackson - Fun. Stuck In The Middle by Virginia Smith - Alright. Fools Rush In by Janice Thompson - Liked it. The Shadow Of Your Smile by Mary Higgins Clark - Good mystery. When Two Become Three: Nurturing Your Marriage After Baby Arrives by Mark E. Crawford - Liked it. A Woman's Call To Prayer By Elizabeth George - Very good. Fudge-Laced Felonies By Cynthia Hickey - Fun mystery. Sad Cypress by Agatha Christie - Good mystery. At Bertram's Hotel by Agatha Christie - Good mystery. To Be Perfectly Honest by Phil Callaway - Interesting premise. Not For Sale: The Return of the Global Slave Trade - and How We Can Fight It by David Batstone - Good, but overwhelming, but good. Note: Mature Subject Matter. Unplanned by Abby Johnson - Good, thought-provoking. Note: Mature Subject Matter. The Christmas Singing by Cindy Woodsmall - Light, good. The Trouble With Tulip by Mindy Starns Clark - Loved it. Building Her House by Nancy Wilson - Alot of good thoughts. And I started a smattering of other books, but I'll include them in next year's post since I'll be finishing them in 2012. Like I said, let me know if you have any questions for me about any of these! And have a great New Year's Eve! Here is part two of our 2011 recap! -Wyatt rolled from his back to his stomach on the 2nd! Derek and I took an anniversary getaway the weekend before the 4th! -Wyatt’s first Independence Day! We celebrated by taking him on his first trip to the zoo on the 3rd. -The last space shuttle launch on July 8th, at least until the re-fund the space program. I was not happy about it. -Wyatt turned five months old. -We celebrated our anniversary! Derek surprised me and took us to this farmhouse restaurant for dinner. -Wyatt grabbed his feet for the first time that I noticed on the 22nd. -We started Wyatt on solids on the 23rd! We also took him swimming for the first time! -I quit Facebook. I never wrote a post about it, but I might at some point. -I went to physical therapy, but only once. Apparently that was enough to loosen my knee up, because shortly thereafter I could walk without much of a limp! -Wyatt started to give me kisses on August 1st! -Somewhere in the beginning of August I went to a hematologist, who told me I should be on blood thinners for six months, even after bloodwork confirming I have no unusual clotting factors.. I got a second opinion from a different hematologist, who said I could go off of them right away, because I had been on them for three months, and my clot was so small it was almost gone. I went with the second hematologists opinion and was so glad to be done with those horrible shots. -We started giving Wyatt more vegetables. He also started sitting up sometime this month. -Wyatt turned six months old! -We had six month photos taken. -We started Wyatt on formula full-time. -We went to a baseball game. -I spent a lot of time driving around the neighborhood looking at houses with Wyatt snoozing in the backseat. Just for fun. -I started packing for our vacation in the beginning of September! -We gave Wyatt even more vegetables and fruits this month – he liked everything! -We went on vacation out East to visit Derek’s brother and sister-in-law! We had a great time! -Wyatt flew on an airplane for the first time, met his aunt and uncle for the first time, and saw the beach for the first time! -Wyatt turned seven months old! - Derek and I went out on a date for the first time in months. -I started feeling crafty and started on a few projects, including tailoring a men’s shirt to fit me. -Somewhere in here I moved my toiletries into our newly finished downstairs bathroom, which we finished over the summer! The basement is officially complete. -My sister got engaged! I believe it was in September (I start to lose track of things if I don’t blog about them right away!). More to come. -I looked at our monthly budget and started considering cloth diapering. I bought our first cloth diapers (Oh Katy and Fuzzibunz were the first ones we tried). -I realized September was banned book month (and I participated by reading the Bible!). -I gave Wyatt his first teething “cookie”. -Wyatt and I went to Ikea for the first time. -Wyatt turned eight months old. -Wyatt started getting up on his hands and knees and rocking back and forth. This happened sometime in October I think, I’m not completely sure when, but it was so cute! -Wyatt got his first tooth on the 16th! Followed closely by the second on the 19th. -I got up my courage and we started using cloth diapers. -We visited a pumpkin patch and corn maze with Wyatt! -I planted flower bulbs for the first time, painted a shelf for the new bathroom, and started on a quilt, all recapped in this post. -Wyatt started army crawling somewhere in here – I didn’t write down the exact day, but it was somewhere toward the end of October or beginning of November! -I started posting more about cloth diapers (first impressions, about the money, and various posts with tips from other moms). More to come in 2012. -Wyatt kind of waved on November 13th! -I hosted the Salvation Stories link-up on my blog and posted my testimony – I loved reading everyone’s stories! -We had our Christmas pictures taken. -We celebrated Thanksgiving (Wyatt’s first), and set up our Christmas tree! Wyatt picked out his stocking and saw Christmas lights for the first time. -We gave Wyatt pureed meat for the first time. First it was ham and gravy and he hated it. Then we tried chicken and apples, and he liked that better! We also tried pumpkin on Thanksgiving Day. -We started bundling Wyatt up in his cute winter coats, we went on a Christmas shopping trip with Wyatt, and we got a beautiful advent calendar from Derek’s brother and sister-in-law! All recapped in this post. -Wyatt pulled himself up on his knees (7th). -We hosted an ugly sweater party. -We took Wyatt to his first Christmas parade. -Wyatt turned ten months old! -We bought Wyatt’s first Christmas ornament, and our first family-of-three ornament. -Wyatt had his first haircut on the 23rd. -We celebrated our first Christmas with Wyatt! -Wyatt got his second upper tooth on the 26th. -We celebrated Derek’s birthday by going ice skating, out to eat, and to a movie. -We celebrated New Year’s Eve! So much has happened for our family in 2011 – most significantly becoming a family of three! The Lord has given us so much to be thankful this past year, and I feel so blessed. I’m looking forward to seeing what He has in store for us in 2012, and I’m so glad that He is in control of our story – because His plans are the best plans! Wishing each of you blessings in 2012! The year 2011 has brought so many wonderful changes to our little family! Every year I do a recap of highlights from each month of the year, and this year’s recap will be fun to write because so much fun stuff has happened! I’ll do the first six months today and the second six months tomorrow. -I reached 32 weeks in my pregnancy. -We took some maternity pictures on January 8th! -I had my baby shower on January 9th. -We continued to work on my crazy baby to-do list. -I reached 34 weeks in my pregnancy. I was measuring 3 centimeters behind, so we scheduled an ultrasound to check my little guy’s growth. -The girls at work threw my coworker and me a joint baby shower! -I got my little guy’s baby book in the mail! -We found out the baby was growing just fine at the ultrasound, and I got to see his chubby cheeks. -I got an iPod touch to replace my poor Nano. -I bought an adorable little hat for my Babykins. -At my 36 week appointment my blood pressure was high and I had some protein in the initial urine tests. The sent me to the hospital and kept me overnight for monitoring. The day I turned 36 weeks pregnant I spent in the hospital. -They lost part of my 24-hour urine test (how do you lose 600 mL of urine between the hospital room and the lab? I have no idea), but my blood pressure was better, so they sent me home to repeat the 24-hour test on my own. I posted a full recap of that adventure here. -I went in for another doctor’s appointment and got the highest blood pressure reading yet. -I got the results back from my second 24-hour urine test, and it wasn’t so good. Off to the hospital we went to be induced! I was so excited and scared at the same time. -On February 11, 2011 our sweet Wyatt was born! A moment that changed my life forever. You can read the full birth story here. -We came home from the hospital on February 13th. -We spent Wyatt’s first Valentine’s Day as our first full day home as a family! -After Wyatt was born I finished some of the final touches and revealed his nursery! -We just spent the next few weeks figuring out life with our sweet baby! I did end up getting pretty sick with an infection in there too, but it cleared up nicely with some antibiotics. -I finally posted our maternity pictures (here they are, part one and two). 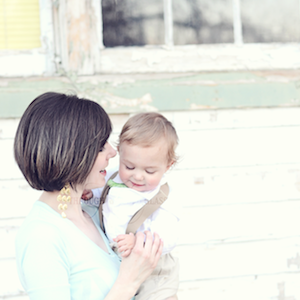 -We had Wyatt’s newborn photos taken (session one and two). -We reached our due date with a three week old baby! -Wyatt turned one month old. -We lost the bumper on our car. I was sure it must have been stolen, but what I never got around to mentioning on here was that we did end up finding it later. How it fell off the car without being loose, and without me hitting anything with it will always be a mystery to me. -I started getting out more with Wyatt. -We had several firsts – Wyatt’s first basketball game, first date without Wyatt, Wyatt’s first shoes, etc. -Wyatt rolled over (stomach to back) for the first time on March 27th! -I took Wyatt on his first walk outside on April 1st. -On April 2nd Wyatt smiled for the first time! -Derek and Wyatt had their first “guy’s night” (April 4th) while I went out for dinner with my mom and sister. -We got to meet Anne and her husband for dinner on the 5th! -Wyatt turned two months old. -My laptop died and I had to get a new one. -Right when I got home from picking up the new laptop, my knee “popped”, and I fell and realized I couldn’t move my leg with pain shooting through my knee. Thankfully I wasn’t holding Wyatt at the time. I dragged myself and the carseat inside our front door and shortly after went to the urgent care center (horrible experience there). -Ended up going to the ER. Found out I tore the meniscus in my knee and flipped it out of place. Scheduled surgery. -Had surgery the next morning on the 17th. -Wyatt blessed us by starting to sleep through the night on April 20th/21st! Right when we needed rest most. -I spent the next week on the couch because I could hardly move without pain, and tried to figure out how to use crutches, which I would be on for the next six weeks. -We spent our first Easter as a family! -I ended up developing a blood clot in my leg and they put me on aspirin. I felt like a sickly person for the first time in my life. -Friends and family came to help me for the next several weeks, because I was not allowed to put any weight on my leg and therefore couldn’t carry Wyatt around. -Trimmed Wyatt’s nails for the first time on April 28th. -I spent a lot of time on the couch blogging and watching TV since I couldn’t get around to take care of my own baby. This was pretty depressing. But the idea for the Moms and Babies feature was born during that time, and I finally made a blog button. -I posted the reveal of our new bedroom in our finished basement! It had been finished for a while, but I finally got around to posting it. -It was getting really hard not to feel depressed about not being able to do anything with Wyatt and sitting around all the time. -Osama Bin Laden was killed. The post “Death Of An Evil Man” has my thoughts on the subject. -Wyatt laughed for the first time on May 10th! -Wyatt turned three months old. -I had my first Mother’s Day as a mom! -I went to a tea party at Ashley’s house. It was so fun! -I had an ultrasound to check on blood clot and it was still there. I was put on injectable blood thinners. -It snowed and we built Wyatt’s first snowman. -We lost our dog for three weeks while she went on a trip to Missouri. -I started to get a little more independent, because I figured out that if I stationed myself and Wyatt on the couch with the baby bag and bouncer seat within reach, I could take care of us both by myself. This worked out well for the last couple weeks of my crutches. -I visited my orthopedic surgeon and got the okay to get rid of the crutches! What I didn’t mention was that I burst into tears after that appointment when I realized that even though I technically could put weight on my leg now, I still couldn’t walk very well without my crutches. I spent the next few weeks with very limited movement in my knee and a horrible limp. -Wyatt turned four months old. -Wyatt started grabbing toys intentionally (15th) and held his own bottle (19th). -We celebrated Derek’s first Father’s Day as a dad! -We got rid of our satellite TV service. I wrote about why in these posts (part one and two). -Blood clot still there. More injections of blood thinners. -Found out my sister-in-law was pregnant again! -We just enjoyed the beautiful summer weather. We had a wonderful Christmas weekend! On Saturday (Christmas Eve), we went to visit Derek’s family. We ate a wonderful breakfast, played Monopoly, and Wyatt got a bunch of fun toys and books! He was getting into the present-opening here. We we went home, watched “The Nativity Story”, and got Wyatt ready for bed. Listening to the Christmas Story from Luke 2 while Wyatt ate dinner. Reading “’Twas The Night Before Christmas” with dad! After Wyatt went to bed Derek and I got all his presents put together and set out! We enjoyed our sparkling cider and glowing tree before bed. Here are the guys coming upstairs on Christmas morning! He really liked his new wagon. We got Wyatt blocks, a wooden train, little toy trucks and cars that light up, and the Roadmaster wagon. Then I had a bunch of movies and books that I had collected for him, so I just decided to wrap all those up too, just for fun (even though I didn’t actually buy them for Christmas presents). We opened about half his presents before he started looking tired and we put him down for a nap. Derek and I opened some presents next. I was so excited! He’s always telling me how I can’t get an iPhone, so I was totally surprised that he gave me one for Christmas! Our stockings (that’s a dinosaur toy poking out of Wyatt’s in case you were wondering). And of course our dogs needed their presents too (Ralphie, the little one I’m holding, has come to expect one – I almost forgot to give him a present last year and he was just waiting for me to remember). We went over to my parent’s for Christmas dinner, games, and gifts in the afternoon. We got to open Wyatt’s gifts while he took a nap. Then he woke up and was there to open his own. Later we went home and opened one more present before putting Wyatt to bed. We kind of stretched Christmas out to the next day and saved our “hidden present” tradition until that night! And Wyatt and I took a picture with our new phones too! Overall, we had a wonderful first Christmas together as a family! I hope you all had wonderful Christmas’s too! This week we’re celebrating my handsome husband’s birthday! There are so many things I love about Derek, and I thought in honor of his birthday, I would list a few here. 1. I love your heart to follow the Lord. 2. I love that you are a strong spiritual leader for our family. 4. I love how dedicated you are to providing for us. 5. I love that you are a hard worker. 6. I love that you can fix our cars yourself. 7. I love that you put up with the dog (you know which one) because you know that I love him. 8. I love seeing you get so excited over football (even if I might not always understand it, I still think it’s cool). 9. I love how you are patient with me (and I know being married to me you need a lot of patience). 10. I love that you love decorating for Christmas as much as I do. 11. I love that you are such a wonderful dad to Wyatt. I can already tell he thinks the world of you. 12. I love that you are athletic, and that you enjoy sports. 13. I love that you are also so smart, and in all the areas where I am completely clueless. Our kids will be well-rounded in every subject. 14. I love how you are always warm (perfect match for me, considering I’m always cold). 15. I love that you are loyal to your family and friends. 16. I love how you are always so thoughtful, and how you try to think of little things to help others. 17. I love how easy-going you are. 18. I love that you are my voice of reason. I’m usually the voice of reason for others, but you are mine. 19. I love how you eat my food without complaining, even when I burn it. 20. I love your singing voice, and I could listen to it all day long. 21. I love how strong you are – I always feel safe with you. 22. I love your brown eyes. I’m glad I get to look in them every day. For that matter, I’m glad I get to look at your face for the rest of my life! It’s such a handsome face to get to look at. 23. I love how you like kid’s movies, just like I do! 24. I love your sense of humor. 25. I love how much of a man you are. People make jokes about the differences between men and women, but the differences are beautiful. You are 100% all-man, and I love that. 26. I love how you aren’t afraid to try new things with me. 27. I love that you are such a determined person, whether it’s with hunting or learning something new, or finishing a project. I love that you don’t give up. 28. I love that you are never one to hold back a compliment. 29. I love that crazy face you make for the camera when you are trying to mess up my pictures. It makes me laugh every time. 30. I love your sense of adventure. I love everything about you, Hon, and I love who we are together! May these next years of your life be even better than all the years before! I love you, Derek. Happy Birthday! This year I’ve been thinking about the “wise men” that came to visit Jesus. I know that there are a lot of opinions about who these guys were, when they came to visit Jesus, how many there actually were. But there is no debate about the fact that they came. These were men who lived in a different country. Had they ever been to Israel before? Did they believe in the coming Messiah, or were they just trying to figure out what was going on? The Bible doesn’t address those questions, but it does say that they came because they knew a new King had been born, and they wanted to worship Him. I wonder how they knew a King had been born. Was it a guess based on the star they saw in the sky? Or did they know because they had been watching for Him? How did they know to come? I can just imagine them going about their business, watching the stars as they always did, and then realizing that something was different – seeing that new star, and knowing something good was going to happen. And then getting the call to go. Not really knowing what they were going to find, not knowing exactly what they were doing, but knowing they were supposed to go greet this new King. Knowing they must worship Him, because He wasn’t just an ordinary human being. Whatever these men might have believed, it’s obvious that God wanted them to go. To go and see what God wanted to show them. Whether they believed in the Lord and knew He had called them to go, or whether the Lord just put it on their hearts without them realizing it was Him, He told them to go. And they went. Without fully knowing what waited for them, but instead following in faith, knowing He had good things planned. Trusting Him. Then I started thinking – I want to be like that. When I know I should do something that is uncomfortable or crazy because God is telling me to, I want to just do it. When I’m not sure where He’s taking me, or what I’m looking for, I want to continue to follow where He leads steadfastly, without doubting. He had a plan for the wise men, even though I’m sure there were times when it didn’t seem like it. He has a plan for me and you. And if we’ll just follow where He leads us, in faith, trusting Him, He will have good things in store, even if we get as far as Heaven before we see it. Because He is faithful. Because His promises are true. Because when we follow where He’s leading us, He will be waiting for us at the end. And if we realized that, no bend in life’s road would scare us, no unseen future would steal our joy. He has good things planned. Wishing you a wonderful Christmas with your families as we celebrate the birth of the Giver of Good Things, our Lord Jesus Christ! I’m finally getting around to posting the pictures from our Christmas card photo shoot! And right before Christmas, no less. My aunt took these, and I think she did a fantastic job! If you are in my area and want her information, please let me know. I did the editing, however, and I’m no pro, so please keep that in mind! I like them, but editing gurus might be able to find all my mistakes. I hope you will consider this my Christmas card to all of you, my Blog Friends! I couldn’t send you each an actual Christmas card, but I’m so happy to know each and every one of you, and I pray that you and your families have a merry and bright Christmas as you remember that Jesus is the reason we celebrate! The Best Way To Spread Christmas Cheer . . .